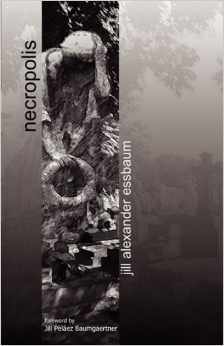 National Poetry Month | Put Words Together. Make Meaning. Yes, I know it’s day 17. And I am not having much luck keeping up with the poem-a-day. But I decided to do some revision work today, and I’m feeling much better about at least attempting to keep my mind occupied with poetry this month and keep the practice going. So even though it’s day 17, I offer here Poems 10 and 11, one a very brief little nugget and the other a revision of a poem in a series I was working on earlier in the fall using titles from “Battle Hymn of the Republic” lyrics. my God – how you bled. Some interesting finds from the past couple of days – hope you find something to strike your fancy.Also, watch the sidebar scroll here or follow me on Twitter (@djvorreyer) to read lines from the chapbooks my 7th grade students created this quarter. I will post this week, maybe next week while I’m on vacation, and then continue as long as I have lines to tweet. 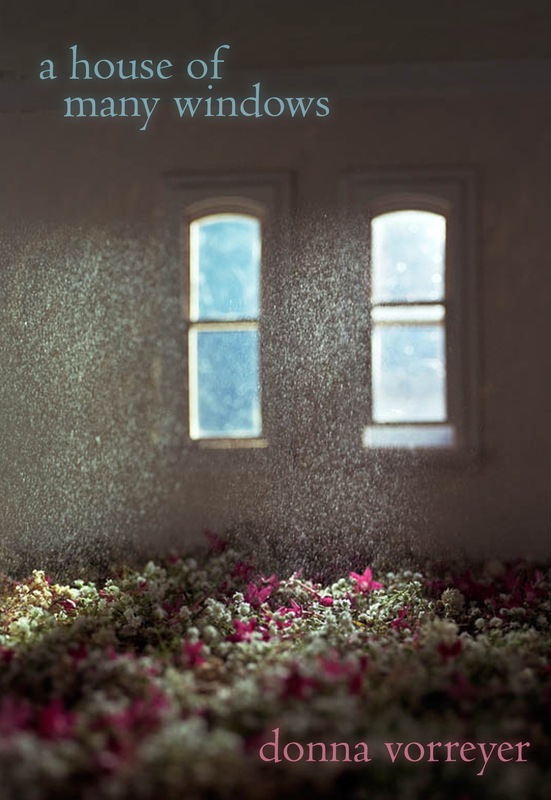 Wonderful new poem “Inside the Balloon” at wicked alice by Jessica Ankeny. 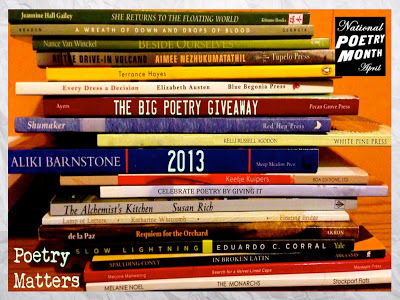 And, of course, go to Susan Rich’s The Alchemist’s Kitchen to participate in The Big Poetry Giveaway – she has a running sidebar of all the bloggers who are giving away books. Including me! The Big Poetry Giveaway is Coming! Sorry I have been quiet as of late…the end of a quarter at school, the oppressive slate of grey skies, and my impending vacation with the wonderful husband have been occupying my mind and my time. But…it’s almost April and that means National Poetry Month. 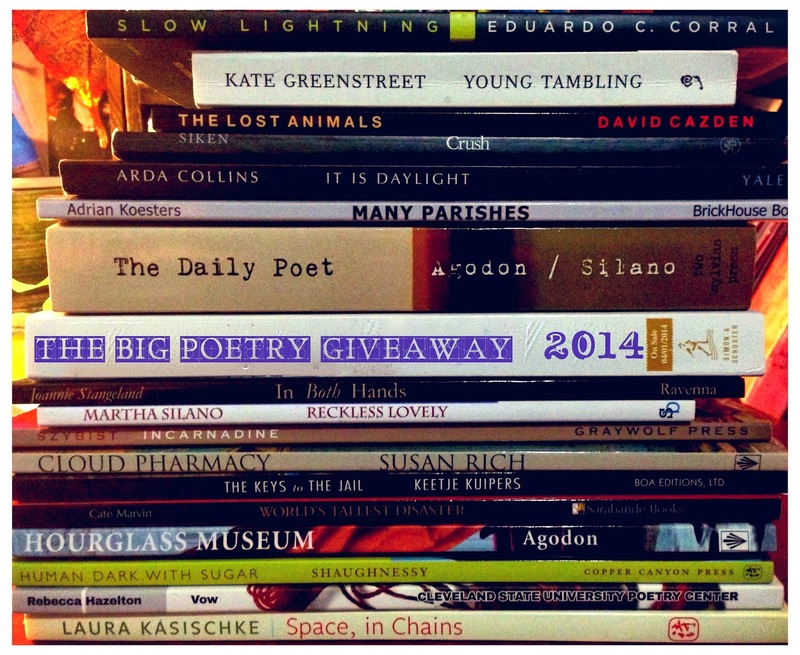 And that means….the Big Poetry Giveaway is here! You leave a comment on this post between April 1 and April 29. I choose a random winner at the end of April. 2. I have been a middle school teacher for 22 years and I am still relatively sane. 3. I love music, especially live music, and I sing and play the piano and the guitar. 5. If you bring me a Diet Coke, I will be your friend. 6. I have traveled to every continent except Antarctica. 7. I confess that I watch WAY too much television…although usually while multi-tasking and grading papers or lesson-planning or writing blog posts…like right now…I am watching The Walking Dead as I type. So leave a comment! And win books! And visit Susan’s site to look for more blogs to visit!